About the time I get around to posting, time seems to have absolutely flown by. I often wonder where it went even then……. I guess being busy has a good deal to do with why I don’t often post to here. Let’s see what is happening currently……..
“Pajama Girl” has been on a roll. She’s doing all kinds of crazy and wild things these days. Her current interests are more home items and less clothing. She rolls with whatever idea comes to mind that the two of us can find a way to create. So much fun!! Projects of late have included a basket made out of wrapped clothesline that turned out totally adorable. She gifted it to her mother-in-law for Mother’s Day. Another basket is underway, but has yet to be revealed. Last evening, she had this sun sail that she had purchased that was not of a shape that she wanted, so……we cut it down. Two sides are each 20 feet long-the original width I am uncertain of as she had cut it down prior to my arrival. After a supply run to JoAnn’s for upholstery thread, size 18 needles and belt webbing we got underway. SEVERAL hours later it was completed. It took about 1200 yards of thread!! Each side was stitched six or more times. Good grief!! She reported today that she had put it up and it was just how she wanted it. Please help me welcome back “Blue Girl” who took a break for awhile and has reappeared with some fun plans. She has an interest in tiki prints and somewhat challenging projects. She enjoys repurposing fun fabrics and has a definite creative side to the things she makes. She recently made a faux fur vest that is completely lined. She is nearing completion of a pair of cargo pants with really cute pockets. She is learning the Palmer/Pletsch manner of fitting pants and her first pair out of a linen like material has an amazing fit. “World Traveler” is fairly new and has tackled an interesting variety of things so far like Greek letters for clothing applique use on t-shirts. She has also begun to make fancy dress clothing for her cute little doggies that weigh about 3 to 4 lbs. So cute! She will add bling to the clothing with hot fix crystals. She is also going to learn the use of her serger. There are other new individuals arriving and just getting underway so nicknames have not quite been chosen as yet. If you are not mentioned here or you don’t recognize yourself in the description, it is not meant as an oversight deliberately. Check back later and perhaps you will recognize yourself. Merry Christmas, Happy Holidays…………whatever you prefer–Even Bah Humbug! December is upon us and as all good things come to an end, so does 2014. Many great changes are afoot. New people continue to come on board to make life interesting. Some of my personal projects have been completed, thank goodness! And new projects are in the wings. “Pajama Girl” has been on a roll the last time we met. Together in one evening, she cut and sewed 7 pillows with zippers then went on to cut and sew 15 pillowcases. It became a game to see how much could be accomplished. She had a little help with the ironing, so all she was doing was cutting and sewing. Quite a major display of effort on her part, but won’t family and friends be surprised with her accomplishments? Her skills have continued to improve and she has developed a serious “need for speed” as a result of her serger! Please help me welcome “Tights Girl” to our group. She comes with an interest in exercise wear and swimwear. So far she has successfully made well fitting tights for herself from a pattern we developed, after a potholder and jammies of course. New on the horizon is “Bag Lady” who is making the most darling zippered bags after learning to use a zipper foot. They are perfect for that makeup bag that ladies want in their purses. She has a shop on Etsy with them for sale. Ask me for the shop name if you are interested in seeing them. “Sergers & Sausage” is joining us with wanting to up her skill level by incorporating a serger into her projects. She was kind enough to offer to help complete the capes for the Great Santa Run by allowing me to work with gluing that fur in her garage. Fur is messy! “Dolly Girl” is a delightful individual (yes, she is an adult!) with an extensive collection of Barbie Dolls that she wants to display in her own creations. Her shopping trip was a panic! She was so excited she could barely contain herself. She will be one to watch out for as I sense a serious fabric stash in her future. “Camo Girl” joins us this month as well. Plans are afoot to re-purpose some military uniforms into fun useful items for friends and family. First on the agenda will be surprise items for the holidays. More on those ideas later. As for myself, the Santa Capes are done. The race was run and Opportunity Village used the capes as a fundraiser by selling them at the race as souvenirs. It was a pleasure to be able to participate in this manner. In exchange for the efforts, Las Vegas Sewing Instruction is represented by a tree in Opportunity Village’s Magical Forest this year. Please come out to see it and support this worthy cause. The forest will be open nightly into the first week of January 2015. Merry Christmas Everyone and best wishes for the coming New Year! What?? It’s NOVEMBER?? What happened to October?? The title says it all…October vanished in a blur and I can’t get it back! Update on the capes – a small snag (me) was hit and the cape completion was delayed. Hopefully after this week it will be attacked in earnest and completed. Funny how life can get in the way at times don’t you think? In October, I had the dubious privilege of altering two dresses for local Homecoming events. Both had unique problems and one in common, lots and lots of crystals. Garments with crystals may take one of two approaches, removal of crystals, or working around them. Both are tedious and contribute largely to the reason that alterations can end up being quite expensive. Pictures available on request if interested. Please help me welcome “Fly Girl” to our group. She is an airline flight attendant here for a limited amount of time who is bored and looking for something to fill her time. So she purchased a sewing machine, and shortly after that chose a serger. She is off and running and is learning to incorporate the use of both machines on a project. She made an adorable shorty jammie bottom. After that she went on to sew the entire jammie top on her own and did some simple alterations as a part of the construction. “Tiny Dancer” joins us also with an interest in swimwear for the women with a generously endowed upper body. She has a distinctly creative streak in that her second potholder ended up monogrammed and heart shaped with appropriately applied bias tape. The result was pretty impressive! P.S. Her nic was given to her as a young child by her father! A big thank you goes to “Illinois Featherweight.” She came to the area while her husband was attending a conference. She wanted sewing lessons rather than shop while her husband was in meetings. During the three sessions we spent together, she made a lined jacket and a stretch denim skirt. It should come as no surprise that the pattern directions were not followed, ummmm, perhaps I should say-not followed closely? All of you know how I roll!! As a result of difficulties encountered during recent classes, some revision of class guidelines became necessary. Please see revised guidelines for additional information if desired. If any questions arise, please feel free to contact me. Thank you for your time. New nics, capelets and sneezes! The intent to blog new names is actually beginning! ….or at least trying to…..lol! Fun people turn up when they are least expected! Isn’t that the way it should be? I think so… Anyway, there are some new folks on the scene and I shall try and introduce them to you as well as provide an update on a few others. “Trapeze Girl” is a new member of our growing circle of fun people. She is a aerial performer for one of the Cirque du Solei shows here. She comes wanting to learn to make leotards and active wear as that is something near and dear to her. Early on we have done a serger class and although the serger will need servicing and some adjustments-it was gifted to her-it will be well worth sending to the shop most likely as it is a machine in good shape. Only yesterday, I met a fun pair of waitresses for their shopping trip. Just for fun, I came up with their nics while shopping and these gave them pause to smile and agree with the choices. I would like to introduce “Crimson Tide” and “Jewel” to you. Crimson Tide originally comes from Alabama, not far from some of my family. Jewel has a unique name that makes you think of expensive jewelry. Crimson Tide has a has an embroidery machine and his plans to do some reworking of shirts. Jewel chose some really fun fabrics for her initial projects. More on the outcome of that later on. “Shoe Man” has had some difficulty with his specialty commercial machine for shoes that are in the process of being resolved. He and I are both a bit less than pleased with tech support from the company the machine was purchased from. He also uses a simpler machine for other work and as I like to say, he has “mad skills” already when it comes to troubleshooting and perfection in his work. He has also created a marvelous cleaning product for shoes that he markets. Do ask about those if interested-you will NOT regret it. The stuff even took shoe polish out of a light carpet without damaging the carpet and the polish had been in the carpet for a couple of years. This polish had not come out of the carpet even after a commercial cleaning company had worked on it. Amazing stuff this is!! I hope he markets this to carpet cleaning companies, it’s THAT good! Since starting this blog, I have been using the first names of individuals and describing what they are doing. I think that it is time for a change though. Since many of my students are aware of each other, and although they have never met, there are characteristics that reflect the personality of each individual which are known by many. The fun part is there have been no duplicates! I think each of you will recognize yourself in the descriptions, and as new students come on board, then a new nic will be created. Not everyone has a nic at this point as it takes time to find something perfect that fits the individual. I hope all of you will smile and enjoy this as much as I have thus far. “Shoe Man” is new on the scene just this past week. He plans to refurbish Air Jordan’s among other shoes and has purchased an appropriate commercial machine for that purpose. There will be another blog entry detailing the craziness that has created. “Potholder Girl” learned to make potholders (and created coasters all on her own) and within a very short time made well over 20 sets that she gave away to family and friends. She is also a yoga instructor and contortionist. It makes one hurt watching some of the wild positions she can put her body into. Wow! “Magic Girl” is a pre-teen that has made amazing pillowcases and PJ bottoms for her mom before the family left for a vacation in Europe where her father was touring. I look forward to restarting her classes in the near future. “Jersey Girl” and “Grommet Girl” are working together on beginning to re-work team jerseys into a more stylish silhouettes for women. Exciting things are afoot with that. They hope to market these and should do well. “Pincushion Girl” is also pre-teen that was challenged to make a cube. She enlisted a bit of help from adults in her family with the end result being the most adorable pin cushion. Parental involvement with children is expected and her mom is right there as a willing and eager participant. Her little brother keeps asking when will he be old enough to start lessons too. Not to be forgotten is “45th Floor Girl” whose interests lie in creating a line of bikini’s and great flower band arrangements for wearing in a woman’s hair. She made the sexiest apron and certainly the man in her life loved it. Shhhh, can’t tell what she did, but it was pretty foxy! “Corset Girl” has a corset in progress. She has made a wool cape with a satin lining also. Currently she is working on a slinky fabric crop top and dressy slacks. They are nearing completion. Following which she will be completing her corset. To date, she is the only person that has attempted a corset. It’s been quite the challenge and she is doing well with it. She plans to attend design school in L.A. next year. “Lawyer Girl” is one of those tiny people that no ready to wear fits off the rack. In addition to doing the usual projects to get her started, she has begun altering clothing items with most pleasing results. “Gym Girl” had some issues getting the sewing machine delivery that she ordered, but is off to a good start after its eventual arrival. Although she had an existing machine, it was a very basic one that did not have a stretch stitch. Since her husband is a sports competitor, having that stitch available was a must-have for her. “Skirt Girl” has to date made 3 skirts with significant pattern alterations both prior to cutting fabric and in fitting it during construction. One skirt had an incredibly challenging fabric as it was printed crooked. Once completed, a person would never have known the fabric was a major headache for her. She is now helping with a project with me that is underway for Opportunity Village. Her participation is greatly appreciated! “Trouble” is yours truly and is a nic I have had for 30 + years. Currently I am coordinating a large project for Opportunity Village making cape-lets for their Great Santa Run. There are 56 cape-lets in progress at this time. With help from volunteers, all the prep work of cutting out 75 yards of red glitter fabric and 26 yards of faux fur was completed in just over 3 1/2 hours earlier this week. The floor looked like someone had thrown up fur when we were through before it was cleaned up. We make GREAT messes and are proud of it! The next step will be undertaken this next week and the cape-lets are anticipated to be completed soon. In exchange for this effort, Las Vegas Sewing Instruction will be represented by a tree (that I will decorate) and signs in the Magical Forest that Opportunity Village does every year. Dates that will be ready will be posted soon, but is to be up approximately November 1st until the first week in January. Please come out to see it and support Opportunity Village in their work with Intellectually Challenged Adults. As people turn up, I will try to log a note with some description of them, but as you can tell, my frequency of writing entries here varies widely. It’s February already?? Where does the time go anyway?? Once again, I am apparently a bit of a slacker here… My humblest apologies for all of that. Time just slips by and I really don’t know where it goes at times. I will attempt (ha!) to keep this short with just an update for the upcoming week. Andrea is back to sewing clothing after a lengthy hiatus of doing home dec stuff while losing an amazing 40 lbs! She looks amazing and now is working on redeveloping her confidence in sewing clothing for herself. Her first dress is adorable. She is getting away from using cotton and instead is working with some very slippery materials that are very flowing and soft. The results have been amazing and I’m happy to see the joy on her face that she is pleased with something she made. 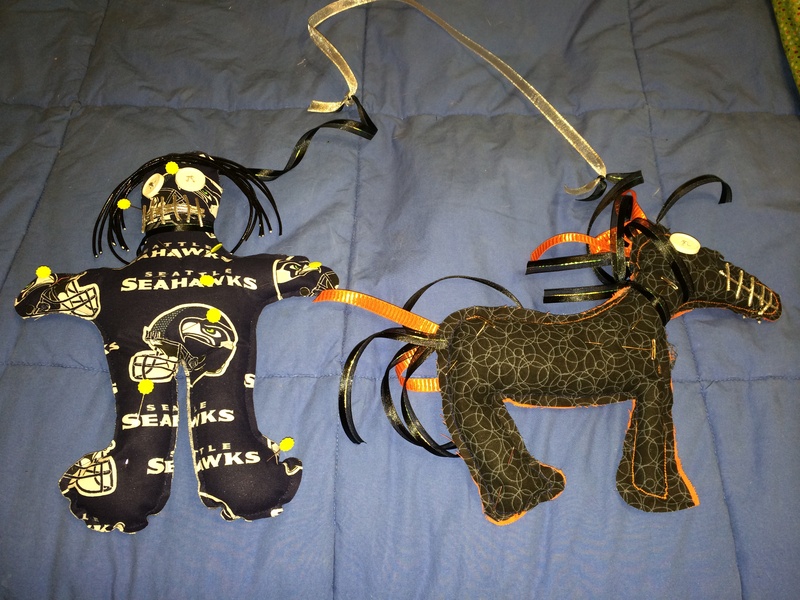 She made these amazing voodoo dolls for Super Bowl. Aren’t they a scream? Mindi is a newbie that has done a bit of sewing some years ago. She is taking it back up for relaxation as it is something that is not terribly physical. Yesterday, the two of us took a XL t-shirt pattern with raglan sleeves and altered it to fit her petite husband. Yeah, right, petite…….NOT! He’s a mere 6’4″ with an appropriate build to match. I can relate to the need to make shirts larger as well as longer to accommodate the large and tall man. There isn’t much out there for the man that is long in the torso. Hopefully we will also plan to make some ties for him as even ties made for the tall man aren’t long enough. Gabriella finished her lined wool cape and has moved on to making a boned corset out of satin. It’s coming along nicely. It has a lot of detail so is taking a bit of time to put it together. It will be fully lined and should be amazing once completed. Kimberly will be starting a dress this week. She wanted to try something new and is up to the challenge. I love seeing people reach out of their comfort zone to try something they are interested in. Patterns can be challenging as we all know, but it takes the willingness to try to use them is all that is needed for starting. Mary Ellen made PJ bottoms for her husband out of alphabet print fabric. Wonder if he has worn them yet? She will be starting a dress for her daughter this week out of the same material so they can match. I’m guessing that Steve won’t wear his jams out when Maye wears her dress. What do you think? This is just a taste of what everyone is doing. It doesn’t begin to cover the month, but is meant only to be a teaser! Wow, how time flies! Seems like I just posted to here a few days ago, only to see that it has been more like 6 weeks. It’s that time of year when our lives get busy. We are wrapping up yet another year with celebrations of our friendships, our work, and our faith. All are good celebrations! Let’s see……what HAS been happening since I blogged last…. Please join me in welcoming some new faces and a little update on what is happening with both new peeps and others! Hmm….where to start? I guess I could just pick a name and go from there. Katie M. (newbie!) continued her t-shirt today and ended up altering it to fit. She had wanted to learn alterations, so this was a start. At the end of today’s class, all she had left to do was hem her shirt and then it will be ready to wear as she flies home to see family on the East Coast tomorrow. Katie has done some sewing previously and simply wants to up her skill level. Carolyn F. is working on PJ’s last time we met and likely has them finished by now. The fabric she chose is really cute! Erica M. has gotten wild and crazy and has been making unitards for use when she teaches yoga classes and for wearing when she does contortions. She also altered them all on her own for a fabulous fit. Her husband has also benefited from her endeavors as she has made him tops for wearing under martial arts wear and he has then had them screen printed with his logo. Guess he is also proud of her efforts. Andrea M. has set off on making her annual PJ bottoms galore for her family. Not sure how many she will make this year, but probably more than the dozen she made last year! Grandma Nan has been acquiring a pair for each holiday…LOL. Her family does love them so! Jennifer G. (newbie) is off to a GREAT start! She’s made a gorgeous holiday apron (well, it IS cranberry color trimmed in cream!) and has completed a serger class. I see fabulous things coming out of her future plans. Jeravae C. is working on a leotard for her husband as part of a ballroom dance ensemble. Swimwear fabric presents some unique challenges, and she is handling them very well. She also puts crystals on her gowns-so very pretty! Kimberly S. has done her shopping trip and has her first class session scheduled. She gets honorable mention for saving a bunch of money on her first time at a fabric store. Laura L. has some great ideas for mixing and matching some fabrics for a boho look that will be darling once completed. She is hinting to the man in her life to upgrade her machine for her for Christmas. Wish her well in the hopes that he will do this. Leigh Ann W. is starting some baby doll jammies. She loves Disney princess fabric and is very much the girly girl. Can’t wait for her to finish them, can you? Malea S. (newbie) is off and running. She did her potholders, apron, a top, slacks, and currently is working on a dress. She’s working on a garment portfolio as a part of her application to attend F.I.T. in New York. She tends to push the envelope a bit by choosing tricky materials to work with and has the patience to do what it takes for the desired end result. She had an end of the semester event for a UNLV class and was able to see firsthand why ironing during construction is so important. Merry D. (newbie) started in a bit of an unusual way. We met by accident while she was purchasing a machine. One thing led to another and we worked together on African styled clothing for a woman attending a wedding locally. Fabulous brocades mixed with gauze is very tricky to work with but oh so beautiful. Piyatida N. (newbie) is planning a children’s line of clothing. She is working on her first outfit for a toddler and practicing her English at the same time as well as trying to learn American yardage and measurements. We work with a blend of American and metric measurements which is good for everyone involved in sewing or pattern making to learn. Many of the sewing machines have already converted to metric measurements and others are in transition to this as well. Oh yes, I hope to learn a little of the Thai language along the way, but its really hard!!! Ryan S. (newbie) came on board and is also off to a good start. However, she is off spending the holidays with her fiance in Switzerland. Must be rough…. She will resume once she returns after the beginning of the new year. Shemika L. (newbie) is just underway. She chose a new machine, did her shopping trip and made her first potholder while getting acquainted with her machine. She is a LOT of fun! Tiffany T. (newbie) was gifted a machine from a friend who got it for a steal. It’s a great beginners machine and Tiffany handles it quite well. I think she will likely finish those Star Wars PJ’s for her boyfriend after Christmas. A word to the wise-we learned that licensed fabric is sometimes narrower than 45 inches, even though it is a higher thread count, so take heed when purchasing ANY fabric to be certain of the width before you choose the yardage. As for my Christmas plans, well…….as of this writing they remain a secret. I’m in hopes of actually having some time to do some reading…….or maybe some sewing…..for me?? Wouldn’t that be something special?? I think so. So on that note, I want to wish each and everyone a very Merry Christmas and a Happy New Year. With out a doubt, I’ve missed a few of you, so please don’t feel slighted. Hopefully I’ll catch you here sooner or later! If you would like to sew between now and January 1st, give me a call. I’m only closing for Christmas Day and New Years Day.